The success of any business is judged by the factors like high level of sales, profits, strong reputation, consumer satisfaction and of course the production of high quality products. Quality is an integral and vital component in all product based businesses, and managing the quality of the product is an essential factor for the survival and successful growth of an organization / business. Quality assurance is a process centered approach to ensure whether a company or organization is offering the best possible products or services to the customers. In other words, it is the process of determining whether products meet customers expectations. Quality assurance has a wide ranging concept covering all matters that individually or collectively influence the quality of a product. The terms 'Quality Assurance (QA)' and 'Quality Control (QC)' are often used interchangeably to refer to ways of ensuring the quality of a service or product. Both the terms are intended to ensure that the data collected are adequate to fulfill project objectives; but they have different meanings. Quality Assurance is the planned and systematic activities implemented in a quality system so that quality requirements for a product or service will be fulfilled. It is all about coming up with the processes and systems used to insure that a product meets company standards. Whereas Quality control deals with the actual testing of a product to make sure it works. It is the observation techniques and activities used to fulfill requirements for quality. Quality Assurance Management can be defined as the management of all quality related project activities such as definition, planning, execution and control. A career in Quality Assurance Management involves management of the quality of raw materials, assemblies, products and components; services related to production and management, production and inspection processes. 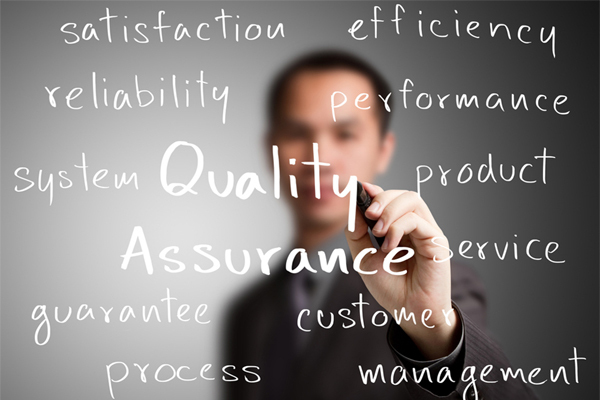 The chief principles of quality assurance management are fulfillment of adequate technical needs, quality of suppliers, check the product for its quality, performance, safety, and reliability standards, proper usage of materials, surety of product's technicality, reliability, maintainability and performance requirements. Quality Assurance is usually performed by a group of people and has many different levels of testing, from testing the minute tiny pieces of code, to the gigantic, testing of final products. A Quality Assurance Specialist, also known as quality monitoring manager or a project manager works with all stages of a project or product. He/ she monitor the standards and methods by which products are produced, whether food, textiles, clothing, vehicles, video games, MP3 player, toys or other manufactured items. It is the responsibility of the quality assurance personnel for developing and implementing quality management products. The quality assurance manager should ensure that all products manufactured or marketed by a company are free from any fault or errors, whether it is new or evolved, is produced and offered with the best possible materials, in the most comprehensive way and with highest quality. The services of these professionals go a long way in making industries more productive and profitable.